We became friends with Melissa Hunsberger in 2007 when we held a fund-raiser for her horse, Just Fun Stuff. Since that time, Melissa has been visiting HVS on a regular basis and inspiring and delighting us with her fun and confidence-building teaching style. 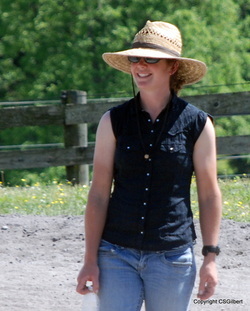 She is happy to teach riders of all levels and experience and especially enjoys bringing along the baby horses. She gives lessons in both dressage and show jumping at HVS, and we also meet up with her for periodic XC schooling sessions at other farms. Hard work, dedication, sincerity, and skill. Those are just a few of the adjectives used to describe Melissa. Originally from Pennsylvania, Melissa knew early on that her future was with horses. But somehow she also had the wisdom to understand that being a student of the horse was crucial. Melissa took a position in Virginia and spent 13 years at the heels of eventing titan Phyllis Dawson watching, learning and growing. She rode anything and everything and looked to each horse for the unique lesson it could provide. Melissa produced horses to the four star level and everything in between, each with pride and patience. In 2007 Melissa successfully completed the Rolex CCI**** with Just Fun Stuff, a former timber horse that she brought up through the levels. This was a personal high point for Melissa and one she would love to experience again. Working each day to become the best rider she can be is still a driving force. Having lessoned with a long and prestigious list of instructors, she still avails herself of the constructive help of fellow professionals. Being a previous member of the Developing Riders Program, Melissa looks to gain that level of involvement again as she works to build and develop her group of young talented horses. Melissa shares the insight she has and is gaining every day with her students. As a Level 3 ICP Instructor, she works with horses and riders at every level. Melissa has the same positive and patient approach with her students, believing that first and foremost, you must enjoy the process of growth and learning. Melissa first built a solid foundation before taking on the challenges of having her own business with sincere dedication and attention to detail.